While you might decide to go to the Greek Islands for the sunset views, the whitewashed architecture, and the island hospitality, the fresh cuisine will certainly top your reasons to plan a return trip. Here are five traditional dishes you’ll want to try in the Greek Islands. 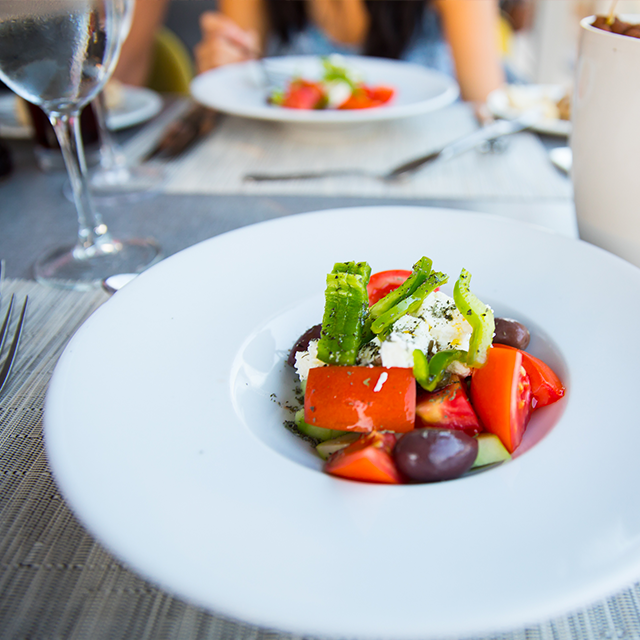 A Horiatiki salad is what comes to mind when you think of traditional Greek salad: wedges of juicy tomatoes, sliced bell peppers and cucumbers, local olives, and a brick of feta cheese. Simple as it sounds, this refreshing vegetable medley is crisp, bright, and an absolute must-try. Made of simple ingredients that are all signatures of the Greek Islands—phyllo pastry, tangy feta, local honey, and sesame seeds—this appetizer is salty-sweet perfection. While several countries have their own spins on moussaka, the Greek version is all about the eggplant. Made of warm layers of vegetables and minced lamb—similar to shepherd’s pie or lasagna—this dish is comfort food at its finest. Plus, the cinnamon and allspice give it a distinctive Middle Eastern flair that’s delicious. Fresh-caught octopus is a must while you’re on the islands. You’ll notice lines with sprawling octopus hanging to dry in the harbors and even outside restaurants. Try it grilled at a taverna, or small tucked-away eatery. Gyros make for a great quick meal. Our recommendation of where to pick one up? Lucky’s in Fira, Santorini is a perfect spot to grab and go, or pull up a stool at the bar. During lunch hour, a queue forms as locals and visitors line up near the bar to order a gyro filled with fries (there are other things on the menu, but everyone gets a gyro here). Have you ever been on a Greek Islands trip? Give us your best food recommendations in the comments below!